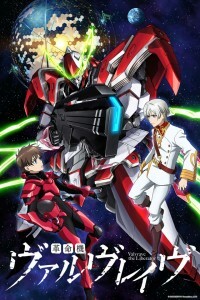 In this stretch of episodes, the students mourn the loss of another of their own, more about the Dorssian empire’s situation and the origin of the Valvraves comes to light, the number of Valvrave pilots doubles, Haruto’s fiercer side finds a new release, and the independent students elect a new Prime Minister for their academy-sized country. Valvrave is still very much a balancing act, with this spread of episodes bouncing from aspect to aspect of the show. Episode 8 was largely Dorssian backstory with some action, 9 was student development development with some action, and 10 was all school life and virtually nothing else. This constant shift in tone is a little jarring, but the show keeps hinting at larger things (then making some of them explicit in explanation later – show, don’t tell, guys, or maybe this show is just that predictable?) and taking story elements and characters in unexpected directions, which keeps me intrigued to see how they’re going to bring all of this to bear later. Considering there’s not much more to go in this season, I’m wondering how much further they’re going to take things before the show breaks for the summer. Ultimately, though, it’s hard to juggle so many things and keep them all in the air. So far it’s looked a little wobbly, but like any good performer, Valvrave makes up for it with some good showmanship.